Ten years in the making, WatchWord Bible: New Testament is a remarkable production over 26 hours of content, much of it shot on location. Each of the 12 DVDs of the New Testament is brought to you word-for-word through a dynamic combination of video, text, narration, music and sound effects. For the broadest reach, it uses the Contemporary English Version, a clear introductory translation. WatchWord Bible is compelling to watch and amazingly easy to understand. Its uses are almost endless: for kids, young adults, seniors, families, the disabled, churches, schools, Bible studies, reading programs and English as a second language. Instant chapter selection on DVD. 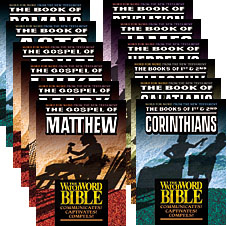 WatchWord Bible -- It's the Word of God!